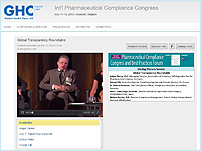 WASHINGTON, DC USA -- PHARMA UPDATE NEWS SERVICE -- OCTOBER 17, 2017: The Pharmaceutical Compliance Forum's Eighteenth Pharmaceutical and Medical Device Compliance Congress, www.PharmaCongress.com, will be held November 6 - 8, 2017 at the Mandarin Oriental in Washington, DC. Registrants may attend the event in person or online (live webcast and archived for 6 months). Compliance Professionals: This education activity has been submitted to the Compliance Certification Board (CCB)#174; and is currently pending their review for continuing education units (CEUs).